Discussion in 'Pandora News' started by EvilDragon, May 3, 2013. 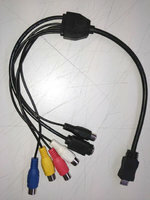 Global Components just received a prototype for the TV Out Cables! I'm going to pick it up today and will do a lot of testing with it. This helps me to find out how many cables I need to order and you'll also receive an eMail as soon as the cable is finished. (If you already preordered right from the beginning, no need to do that, we got your order already). I'm currently trying to ship out the cables to everyone who has preordered and paid one without any further costs (means: to both mine and Craigs customers). However, Craig has over 500 customers waiting for a TV Out cable, which means it'll cost me a couple of thousand euro to ship them out. I'm trying to compensate this, if everything works out fine, you'll all get them without any further payments. But I cannot tell for sure if this works. In worst case, I'll have to charge production and shipping costs for you - but will give you a corresponding voucher for my shop as compensation. So i.e. if I have to charge 10 EUR for the TV Out Cable, you'll get a 10 EUR voucher and could use that to order an SD Card cheaper together with it). Another, FaeMinx, akarolick and 4 others like this. edit: to add water to the "bias" discution from offtopic: FIRST! I do suddenly have a vision of me sitting at home with a tv out and no Pandora in a month or two though. Seriously though, it appears things are moving and all just might be well that ends well. Ah thanks for pointing out the notify button on the shop! I am eagerly awaiting the precious cargo to become available! I am almost ready to slap down some wonga for my 1GHz unit soon so maybe this will fall inline for when the cables are ready! I hope the cable passes your tests as I am eager to get my grubby mitts on one! Can craig deliver mine in person and plug it into my telly.its the least he could do. Mind you i suppose id have to give him a cup of tea at the very least. Seriously though hope it works out. A tv out will be useful as my old one broke after just one use. Seeing how my TV out cable broke a PAX East on the last day, I'll be picking one of these up as soon as I can order one. hopefully a little more sturdy than my attempt of making one.. I found without some kind of stiffener the tiny-bob flexes a bit too much and ends up breaking where the pins met the circuit board. Whats the length of it? Looks pretty short, but probably good enough.. usually you'll leave your Panda right snug up with the TV in this usage scenario anyway, but it may matter to some. Its work but maybe you want to split people into camps again.. people who would gladly pay for it again, just to keep it off yor debt list, and those would just want it without paying again. ie: I'd pay again for it, or whatever, just so as you don't take on another few $$ debt. That is great news ED. Been a LONG time coming. Please let us know soon about the results of your test. A video would be nice. Hope things go well. What're the blue and black phonos, audio in? IIRC it's under 1m, but don't forget it's sockets (female) not plugs, so once you add an ordinary AV cable of your chosing to connect to the TV, it'll be heading past 2m. indeed what is the blue and black female phono for? also that means people will have to use an aditional male to male phono cable to plug into a tv without svideo? Looks nice but I hope there is an extension included, because that's never ever 2 Meters ED talked about (I would prefer 3 Meter long cables by the way). However, I hope production goes well, most Useres had their cables preordered together with the Pandoras since 2008 so they actualy should be payed for already (14€ if I remember correctly). Bit late to the party here, but are Craig's 500 preorders the people who originally ordered a cable when they preordered their Pandora back in 2007 or whenever? Or do I have to order a new one?